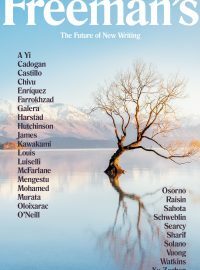 With this issue, Freeman has assembled a dynamic list of twenty-nine writers from around the world that looks beyond the arbitrary prescriptions of national identity, age, or genre and boldly breaks new ground against a climate of nationalism and silo’d thinking. Aged twenty-five to seventy, the writers in the issue hail from almost twenty countries and are writing in almost as many languages. They are shaping the literary conversation right now and will continue to have an impact for years to come. The sprawling, swampy, cacophonous city of Lagos, Nigeria, provides the backdrop to the story of Elvis, a teenage Elvis impersonator hoping to make his way out of the ghetto. Young Elvis, drenched in reggae and jazz, and besotted with American film heroes and images, must find his way to a GraceLand of his own. Nuanced, lyrical, and pitch perfect, Abani has created a remarkable story of a son and his father, and an examination of postcolonial Nigeria where the trappings of American culture reign supreme. The Zookeeper’s Wife tells the true story of Antonina and Jan Zabinski, Christian directors of the Warsaw Zoo during WWII, who saved over 300 doomed Jews, hiding many of them in the zoo cages. One of the most successful hideouts of World War II, it is a tale of people, animals, and subversive acts of compassion. Upon becoming a new mother, Eula Biss addresses a chronic condition of fear—fear of the government, the medical establishment, and what is in your child’s air, food, mattress, medicine, and vaccines. She finds that you cannot immunize your child, or yourself, from the world. In this bold, fascinating book, Biss investigates the metaphors and myths surrounding our conception of immunity and its implications for the individual and the social body. A poignant, hilarious, and inspiring memoir from President Obama’s inaugural poet explores his coming-of-age as the child of Cuban immigrants while grappling with his burgeoning artistic and sexual identities. Navigating these worlds eventually led him to question his cultural identity through writing—and writing in turn prompted the courage to accept himself as a gay man. Blanco’s narrative is a resonant account of how he discovered his authentic self and a deeper understanding of what it means to be American. Innovative theater director and translator, Bryan Doerries reclaims the power of an ancient artistic tradition—Greek tragedy—to comfort the afflicted. He powerfully illustrates the redemptive and therapeutic potential of this classical art: how, for example, Ajax can help soldiers and their loved ones better understand and grapple with PTSD. Doerries revivifies these plays, linking the artistic to the social, showing how suffering and healing are part of a timeless process in which dialogue and empathy are inextricably linked. Andre Dubus III and his siblings grew up with their overworked mother in a mill town saturated with drugs and violence. Nearby, his father, an eminent author, taught on a college campus and took the kids out on Sundays. The clash between town and gown, between the hard drinking, drugging, and fighting of “townies” and the ambitions of students debating books and ideas, couldn’t have been more stark. In this memoir, Dubus shows how he escaped the cycle of violence and found empathy in channeling the stories of others. Warren Duffy’s father has died, bequeathing to Warren his last possession, a mansion in the heart of black Philadelphia.Warren sets off to remake his life with a reluctant daughter he never knew and a haunted house and history he knows too well. In their search for a new life they struggle with an unwanted house and its ghosts, fall in with a utopian mixed-race cult, and inspire a riot on Loving Day, the unsung holiday that celebrates interracial love. J. M. Katz was the only full-time American news correspondent in Haiti when the deadliest earthquake in the history of the Western Hemisphere struck. In this visceral first-hand account, Katz takes readers inside the terror of that day, the devastation, and the monumental–yet misbegotten–rescue effort. How did so much generosity amount to so little? What went wrong? Reporting alongside Bill Clinton, Sean Penn, and Haiti’s leaders, Katz creates a complex portrait of this fascinating nation—and the world we live in today . Claudia Rankine’s bold new book recounts mounting racial aggressions in ongoing encounters in 21st century daily life and in the media. The accumulative stresses come to bear on a person’s ability to speak, perform, and stay alive. In essay, image, and poetry, Citizen is a powerful testament to the individual and collective effects of racism in our contemporary, often named “post-race”society. Despite winning the Pulitzer Prize for his poetry book Failure, Philip Schultz could never shake the feeling of being exiled to the “Dummy Class” in school, ignored and not expected to succeed. It was not until his oldest son was diagnosed, Schultz realized that he, too, was dyslexic. In this moving memoir, Schultz shows how a boy who did not learn how to read until he was 11 became a prize winning writer—and a member of a family with not one, but two dyslexics. An inspiring story of the strengths of the human mind. Trethewey’s poems interweave the mistreatment and murder of the Louisiana Native Guards, one of the first black regiments mustered into Civil War service, and the life of her mother, whose 1966 interracial marriage was illegal and who was later murdered by her second husband. As a public and personal testament, this lyrical monument to forgotten voices explores the complex and cultural memory of the American South-and its subsequent historical erasure.